With warmer weather approaching I have an urge to eat healthier and cleaner. So I’ve been stocking up on fruits and veggies and adding them to my diet everyday. Here’s a snapshot of what was on my plate today. Breakfast: Pictured here is my Berry smoothie made with yogurt, mixed berries, bananas, and mango. Totally delicious! What you don’t see is I also had a cup of coffee and just a little bit of oatmeal. Lunch: Today was in office day. So I brought my lunch instead of spending money eating out. My salad had black olives, chick peas, cauliflower, butter lettuce and 2 hard boiled eggs ,and I used a raspberry vinaigrette . As you see I had some yummy fruit too! Dinner: Since Anya has dinner with her dad on Wednesday I made a quick tasty dinner. I sautéed some shrimp with garlic and onions and added steamed Brussel sprouts, carrots and cauliflower. There it is! Easy, quick tasty meals! 3rd Date In A Row.. Could This Be Getting Serious? So I kept my date at the gym today, this morning none the less! So I did a hundred crunches and an hour on the treadmill. Will do some other resistance and weight exercises later, had to get to work. 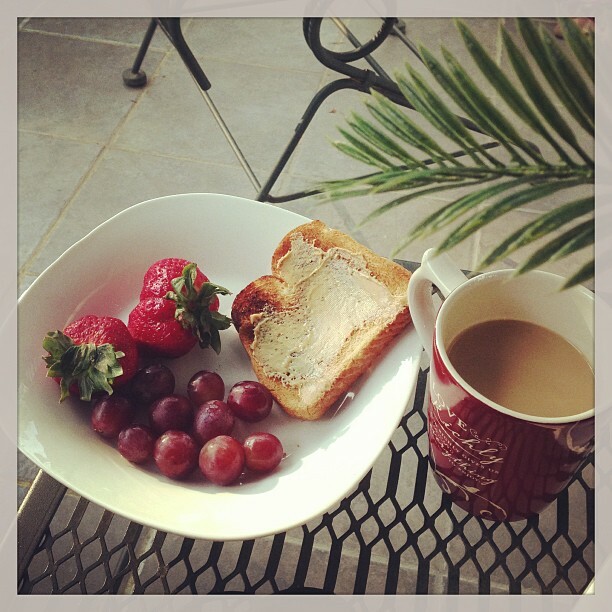 Breakfast-a slice of wheat bread with peanut butter, grapes and strawberries and of course coffee! Oh the gym and I have one of those off and on again relationships. I’m the one always jumping ship! I was doing pretty good awhile back and was actually seeing a difference and then I don’t know what happened…well I do, I just stopped. I was on the ball and then it stopped rolling. I moved which was ALOT, got a new job, and a ton of other stuff but it really is just me procrastinating. So, I went back tonight and it was good. I’m not fool enough to make a pledge of going to the gym 5x a week, but I will say I’m going to make an intentional effort to workout and eat better. So wish me luck…again,. A Healthier Me Update! Wow it’s been long! 1. Don’t compare yourself to others! Remember the perfect ponytail girl with the beautifully sculpted thighs that made me feel like a sweaty wart hog! Well, she didn’t make me feel anyway I made myself feel like that because I was comparing myself to a girl who is built completely differently from me and is probably a good 15 years younger than me. God made me to be me not the pony tail girl and I need to find contentment in that and be the best me I can be! 2. Exercise Daily– Even if you are walking up and down your steps a few times, find a way to squeeze in exercise. Squat while you’re doing dishes or do crunches while watching television, get moving! Any little bit makes a difference. 3. Always Grab a Healthier Alternative– Find a healthy snack you love and then buy it in bulk! If you love almonds get enough to last and keep them at work, home and in your car. My go to is string cheese, grapes and almonds. 4. Don’t be a slave to the scale! I thought the scale was my motivator and in some ways it is, but it isn’t always an accurate way of measuring your weight loss. Make sure you weigh yourself at the same time every day and don’t forget to look at your measurements and take note of how you’re clothes are feeling. If the scale doesn’t give you the number you anticipated, it is okay! Don’t be too hard on yourself. 5. Buy Workout Clothes that make you feel good! I bought a pair of great workout pants from Macy’s with a gift certificate I have and new sneakers and it really does make a difference. I feel better as I work out and that is a motivator within itself. Wear clothes that make you feel good and are flattering. 6. Don’t be afraid to try new moves-I’m a treadmill girl and everything else seems like a waste of time, but if you don’t switch it up then your body gets used to doing the same thing and you won’t see the changes you are hoping for. Plus trying new things keeps you from getting bored. These are just a few tips that seem to be working for me. What works for you? What We’re Eating.. Shrimp Spectacular! I’m loving the food choices I’ve been making lately. I’ve been choosing healthy foods that are satisfying and taste good. After my workout today I had this fab dish! A big leafy salad with garbanzo beans and tomato, with shrimp, mushrooms, basil and onions sauteed. It was sooooo good!! It looks like a lot of food but most of it is the veggies! Oh and it took like 15 minutes!! I realized I didn’t lose as much weight as I thought because some of it was water weight which was discouraging but the scale is moving down and I see a difference in my arms plus I feel really healthy which is a good thing! Don’t be a quitter! How many times did you hear those words as a kid? Yes, there is something to be said about following through, giving it your all and finishing. But, as a single mom who juggles a million balls in the air there comes a time when you have to learn how to quit. Let me clarify myself. Learn how to end your day! When you need break recognize that it is okay to quit. Stop what you are doing and take a time out to breathe, sit, sleep, eat, watch tv, do yoga whatever your heart desires. It isn’t healthy to go, go, go and never stop. We have a double dose of responsibility as single parents and we are on all the time. We aren’t superhuman or robots, we are women with needs and one of those needs for most of us is me time. If you find yourself uncomfortable with this notion, pay attention to the next time your irritable. Are you tired emotionally, mentally or physically? Then it is time to quit! Maybe you need to quit for 15 minutes, an hour, or maybe a whole day! If your children visit their dad on the weekend you have a unique opportunity to quit and restore and your well being. Be intentional about the time you spend on your daily errands and workload. If you have to set a timer for yourself that tells you when to quit. Allot a specific period of time for household chores and when that timer rings.. quit! This requires you to know your body and the rest that you need to feel good! If you’re kids are younger you may want to instill naps on the weekend for you and them! If your kids are a little older and can occupy themselves then have quiet time set aside so they can go in their room and read and you can relax. For this to work you have to be intentional about setting this time aside. Don’t ignore the limits you put in place.Think about way that you can squeeze in some mental break time, it will do you a world of good! So I have this whole draft of my workout updates with calories burned and food eaten, but I decided to talk about something else in this post, something honest and real. 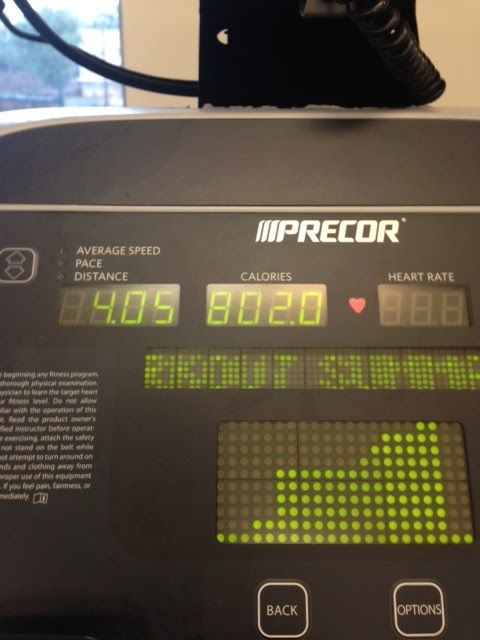 Yesterday, I was on the treadmill, sweating bee bees as my grandma would say when I looked down at the time I had left, I had been riding for 50 minutes at 15% incline and I was tired…bone tired. I wanted to cry. Seriously, I had to talk myself out of busting out in tears, although I’m sure the sweat that was pouring off my face could have served as a cover up. I wanted to cry because I let myself gain weight and become relatively unhealthy. I served my emotional needs through food and now I was paying the consequences. I can drum up the excuse that 2012 was a rough year.. I had to go through a custody trial, spend tons of money, went through a job transition that I thought would be great that isn’t, discover some truths out about people that shook to my core, and so many other things. But, didn’t God have his hand in all of this? Hasn’t he guided me through the rough times and provided for me always? So why did I find it necessary to turn to anything but him? I knew better than this, didn’t I? Hadn’t I been down this road before about four years ago? Didn’t I remember that it is never a good idea to feed your emotions with food? 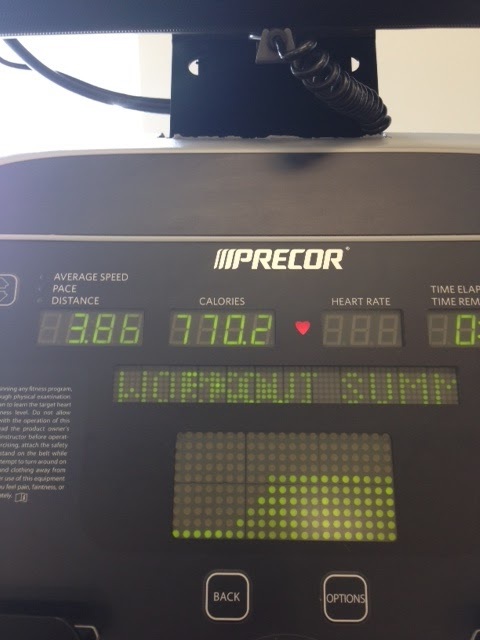 But, there I was on a treadmill next to a girl with the most perfect ponytail and toned legs you ever saw hardly breaking a sweat and actually grinning while she ran happily as I was sweating like a pig! I wanted to yell, ” What the heck are you smiling about!” Yeah I had thigh envy! Do you all know what I’m talking about? Oh and a mirror the length of the wall in the gym did nothing but enhance the intensity of my thigh envy! But, perfect ponytail girl aside I was really mad at myself. I kept thinking about why I chose to slip back into bad habits, because it is a choice. I had a choice about how to handle stress and I didn’t make the best choice. I lost weight before, and I don’t want to toot my horn, but I felt fabulous! I looked good, I felt healthy, and my overall outlook on life was positive. I ate healthy meals, exercised and was in the best shape of my life. So why give that up? Bad habits are comfortable. Those pizza slices I devoured were comfort along with the bags of chocolate licorice and my bed that I found myself in many of evenings when I could have been exercising but didn’t because I was too exhausted looking over the lawyer fees for my custody case. I wasn’t channeling all that negative and uncomfortable emotions I had into taking care of myself physically and even spiritually at times. I’m learning the painful truth about how doing the same thing over and over will only yield the same results. 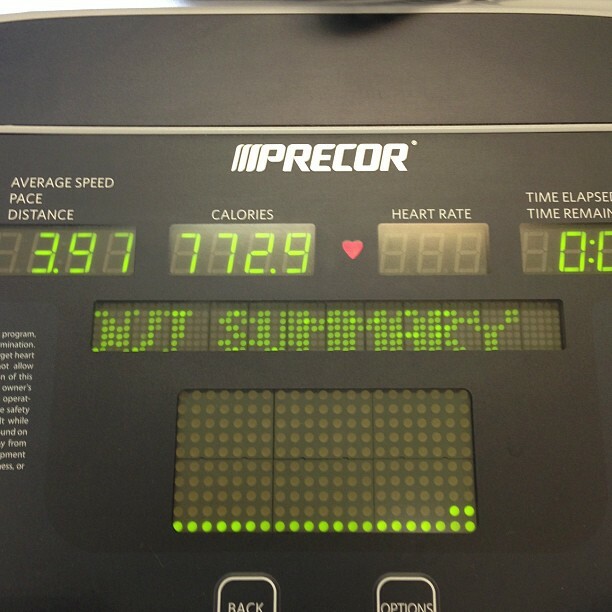 I wanted to hop off that treadmill and say forget it! But, I didn’t, I finished that hour by praying for strength to follow through and he gave it to me I finished. Afterward, I did some strength training, fed myself a healthy dinner of fish and veggies, and then headed off to bible study. I regained a little bit of that determination I once had not because I dug deep down in myself, but because I dug into the Lord. This isn’t just about a lower number on the scale for me it is about learning how to handle life as it comes not through earthly means but through godly means. Do I think God cares about my weight? No, but he does care about me treating my body as a temple, he cares about my spiritual growth and that I’m equipped to do his work. So, I may always have thigh envy, but I’ll continue with my quest to be healthy because I do want a healthier me.. for myself, my daughter, and for God. So I may be posting these a day later because I’m doing a fast from the computer at night. I feel like I spend enough time during the day on the computer and the evening is for me and Anya with no distractions. So, today the weigh in is at 147.8! So I’m well on my way to 147 goal for Sunday, I’m kind of there right? This weekend I want to really get some good workouts in with a little more variety. I’m motivated more than ever, last Friday I was 150 and today I’m 147.8 I’m progressing and that’s what matters along with feeling healthier! Check back on updates for my workout!